A Blog About Best Blogger Tutorials,Widgets,How To,Internet and Computer Tutorials,Gadgets,Laptops,Mobiles and Tech News. 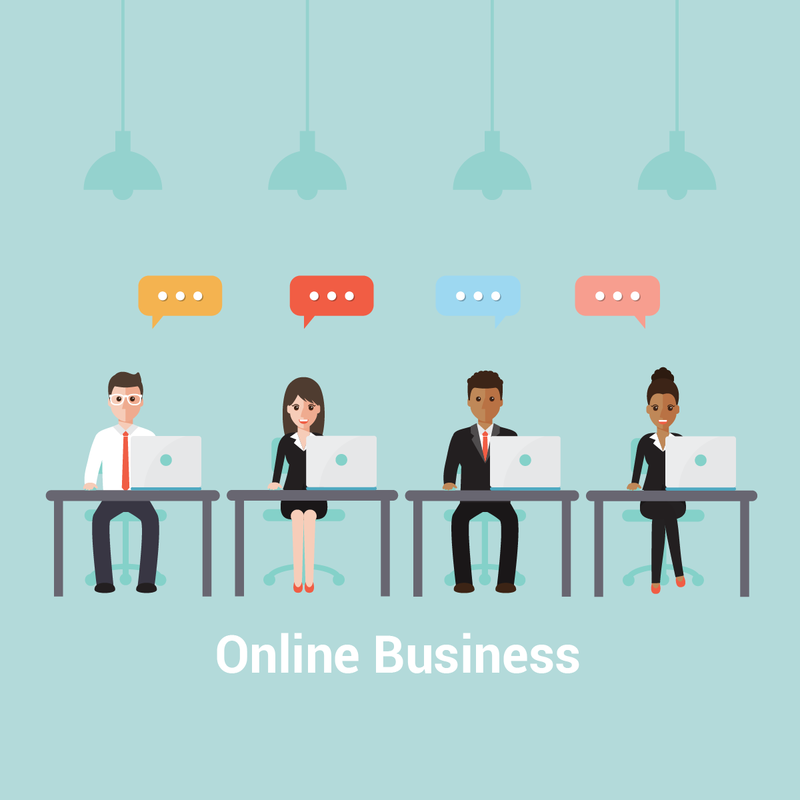 Since billions of years, I have been experimenting with some amazing blogger templates and techniques to utilize Blogger platform in different ways. We use Blogger CMS (Content Management System) just to write articles, ever thought about using it just to host your website? well I did (You can easily make your one page custom website with blogger if you know HTML x CSS) and made this amazing resume template today! 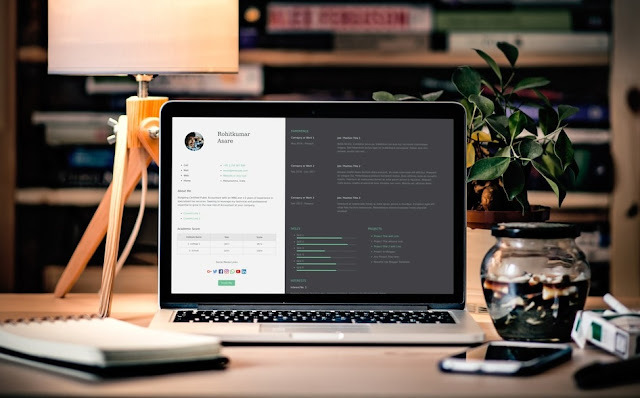 Thus, I made the Resume Lite Blogger Template so you can create your online resume website to showcase your skills and experience. I'll be working on more desings in future, so stay tuned. The main reason behind using this one page template for blogger is that you don't really need to purchase any hosting and pay renewals annually (as Blogger is Free for Lifetime) just to host your HTMLxCSS codes. So feel free to use this template. Extremely light weight, Fast loading. 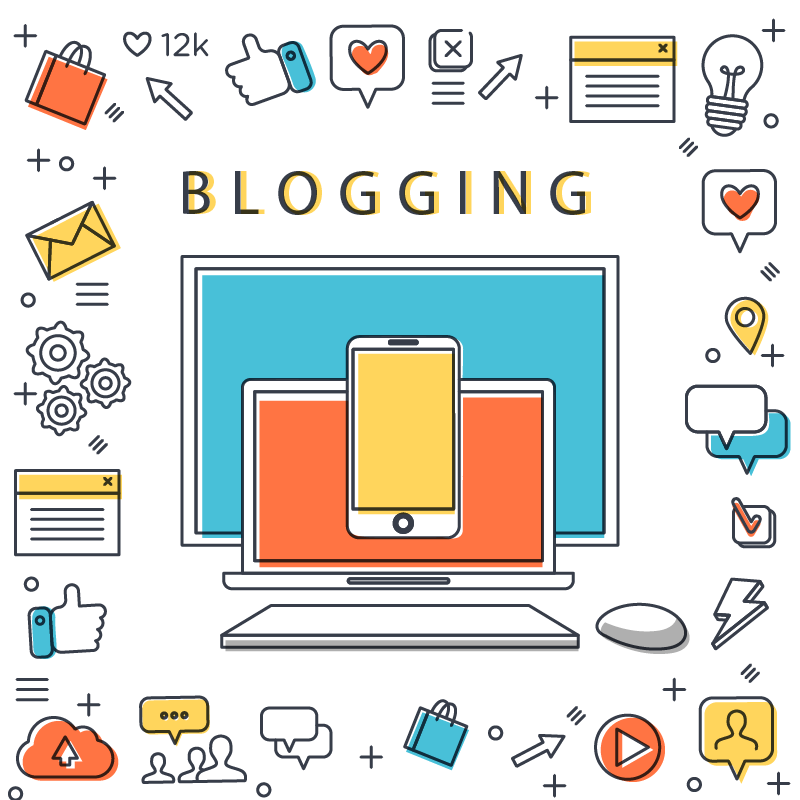 Create a blog from Blogger (Incase if you haven't made one) and create one. Press CTRL+A and Delete all codes. Then copy the template code from notepad (.txt) file and paste it there and hit save. Now to change the name, photos and remaining data find the codes below and replace the texts, you can also check the video below for more information. If you are having any problem or issue just post it in the comments below I'll personally help you with it. Most of the things are self explanatory. I hope you guys must have liked this template, thank you for all your love and support really appreciate, do check our amazing blogger templates and stay tunned for more upcoming templates via emails & facebook, twitter! I know how it feels when a torrent has low seeds and your torrent download manager stucks on 0 kbps while downloading the torrent or sometimes you just want to download torrent as fast as possible. Well, luckily we have Torrent Leeching sites. 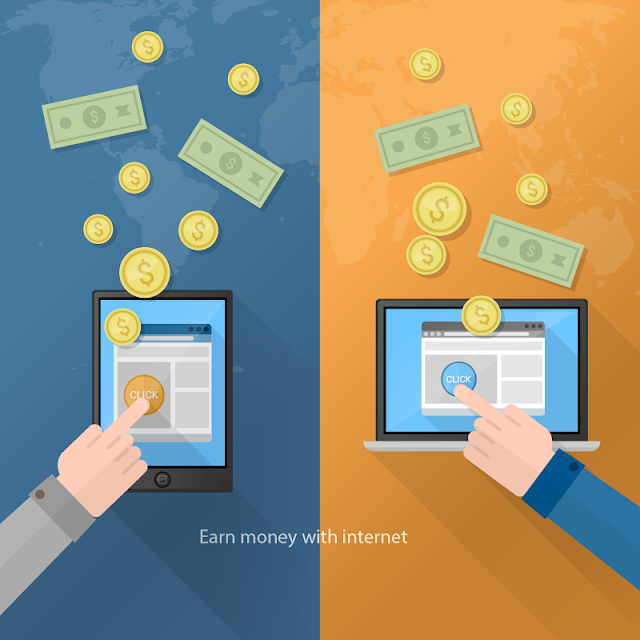 What is Torrent Leeching / Leecher Site? In simple words, a torrent leecher site just simply establishes remote ftp connection and transfers all of the torrent files / file to its online disk space, from where you can download that file with your download manager. So there are lots of Torrent Leeching sites like zbigz, 2giga, premiumize to simply upload your torrents to cloud and then download anytime but the most common problem that everyone faces is the torrent file size and because of 1 GB file limit they are pretty useless. 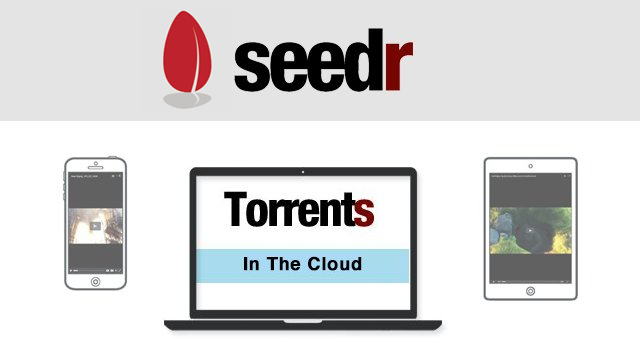 But we do have one amazing website - Seedr which provides torrent leeching with more than 1 GB file limit & also you can get free extra space by some methods as well. So today we are going to see how you can download low seed or almost any torrent with supersonic speed through your internet download manager (IDM) or through browser. Go to seedr.cc and Signup or Login with Facebook. Then grab the Torrent Magnet URL from the Torrent Site. Now why Seedr is one of the Best Torrent Leeching Websites ? Fast Servers with almost zero downtime, your file will be leeched, uploaded to your disk space way alot faster. 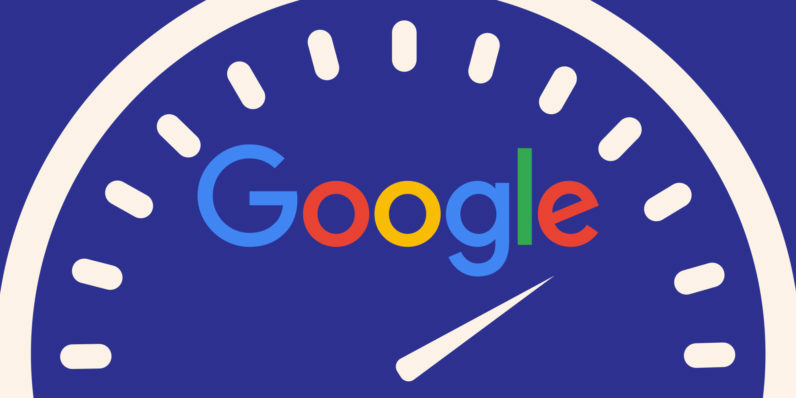 Bonus Tip : Upload The File to Google Drive and Download with Full Peering Speed provided by Your ISP, refer How to speedup download with peering speed for more info. So that's all guys, I hope you must have liked this article, do share with your friends on whatsapp, facebook & twitter! If you have any queries do post in comment section. Subscribe via email and follow on Twitter, Google Plus & Facebook for more amazing articles. Well, after alot of requests I had to make BloggerHero's first ever FREE material design blogger template and I am sure you are gonna like this amazing material design inspired blogger template. 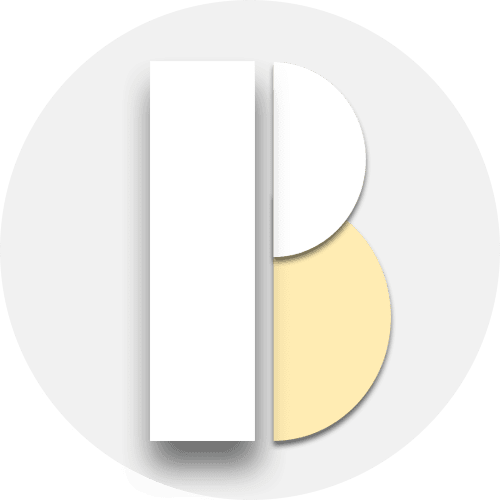 I had released Materiality Premium Material Design Blogger Template last year, so I hope its been almost more than a year now but I promise I'll be sharing alot of premium & free blogger templates. So let's see what we have today! MaterialMix Blogger Template has some stunning ripple effects, I really don't think material design is complete without ripple effect. Click on Header i.e. Blog Title, Post Thumbnails and you will see magic. I really wanted to bring something new so I tried Masonry Grid, you can checkout the Grid Style in live demo. 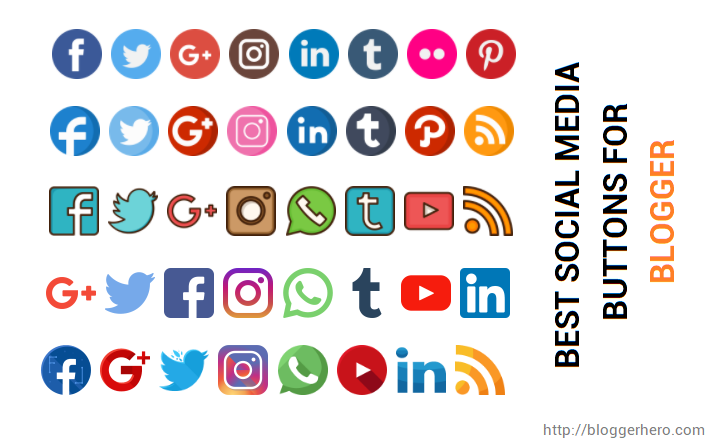 Recently I had shared some cool Social Media Icon widget for blogger, I have used Prism Style icons from the set, do checkout other icons as well if you want to try something new. 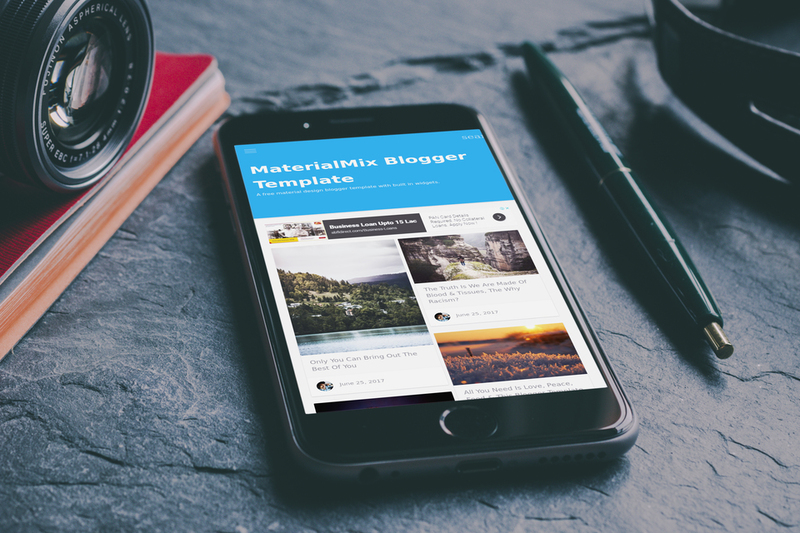 MaterialMix Blogger Template has custom 404 Page, you may checkout that later as well. After learning from few sources, I have finally made some optimized changes to the meta tags I used to use, now they are more optimized and hence google and other search engines will index and rank your blog faster than before. Note : To install this template, first backup your current template and widgets, then open template editor, click edit and select all code (CTRL+A) and Delete it, then copy the code from text file (Open in notepad and CTRL+C) and paste it in the template editor (Which was empty and you had deleted the code from it) now all you need to do is apply and that's it, you can change the navigation men by going into layout tab and adding other links. I will write detailed documentation soon, so stay subscribed! If you guys really liked this template then please share this one with your friends & let me know what other features you would like to see in upcoming updates for this template. So if you really want to have social icons in your blog subscription widget then you should try this or else I'll be making new widget with built in social media buttons, but I really suggest you should try these icons because these are I personally selected from flaticon.com (credit) so I hope you guys will like these amazing social media icons widget which I personally coded to make it more light weight and responsive as well. 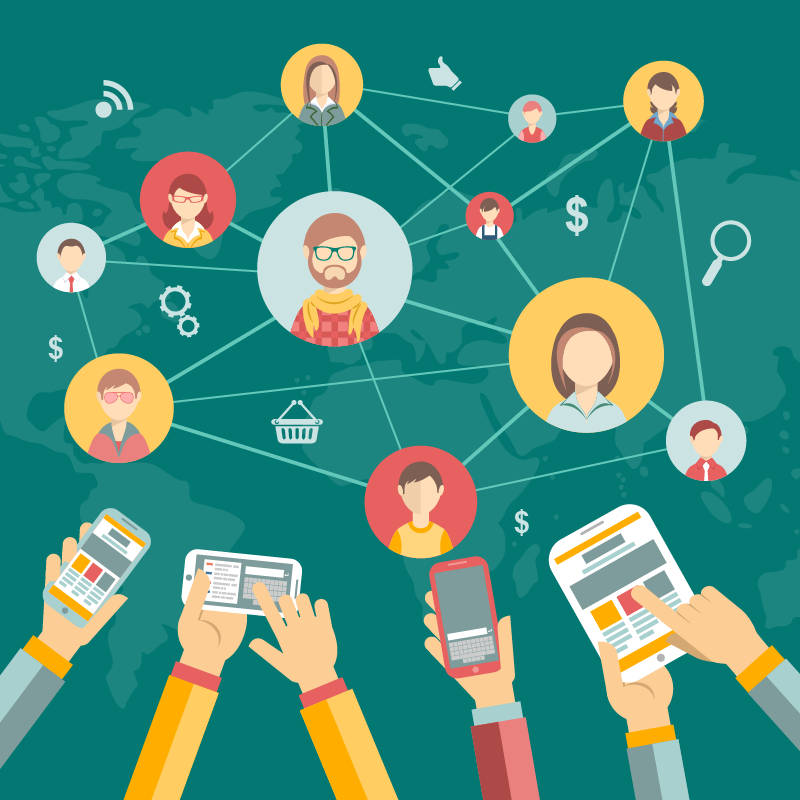 Just find the code <a href="#" rel="nofollow" , now here replace the # with your social media link, for example, for facebook it will be like <a href="http://facebook.com/bloggerhero1" let me know in comments if you face any problem. Here are the most amazing social media subscription links widget for blogger, you can add this to HTML Widget or any section in template file. I hope you guys must have liked these widgets, please comment in section if you are having any issues or any custom query. I am working on One Page Landing blogger themes, Another Material Design Blogger template (FREE Version) So subscribe to this blog if you want to receive amazing blogger templates. Its been almost 5 months I am using 512 kbps internet speed connection which is provided by local broadband service provider. Well we all know that these people show big numbers such as 2 mbps, 10 mbps but in the end customer gets low speed (1/8 reduction ratio) as they provide mbps or kbps ; here the b represents bits not bytes, if it is MBPS or KBPS then the capital B represents Bytes. 1 Byte = 8 bits and that's why you get reduced speed, so I usually get 50-56 kbps speed whenever I download anything from most of the sites except Google Servers and here's the magic we are gonna do today! Well these local broadband service providers in India do provide cheap internet but mostly they provide internet speed with bits and not bytes. But the irony is they don't cap speed for Google Servers, lets just say you won't be having buffering on YouTube, I use 512 kbps and I can stream 720p videos without buffering, this is just an example. I tried with Google Drive and I got freaking 500-510 KBPS speed on IDM (Internet Download Manager) I done some experiments and finally understood that yes we can use Google Servers to speed up our download speed to full ISP (Internet Service Provider) bandwidth. I hope many of you are using the Internet connection from Local Broadband Service Providers, so I hope you should try this trick and let me know your results in comments. So all you need to do is remote upload all of your files which you want to download on your Google Drive, If you don't have much space on your drive then simply upgrade or create new account for it. You can see I am getting hardly 44 KBPS speed here while downloading from servers other than Google. Now go to after copying the download link just go to SaveToDrive.net and you will need to authenticate your account (once for lifetime) and paste your download link in the field. Now just hit upload and wait for it to upload, usually its quick and you can get more than 5-50 MBPS Speed here. That's it, after your file is uploaded to Google Drive, all you need to do is download it from your Google Drive and that's it you can check I am getting almost 453 KBPS speed which is way more than 44 KBPS i was getting before. I hope you guys must have liked today's tutorial and I really want you to try this out and post your results in comments section! Why this happens : There could be one possible reason, they limited everything except Google Servers as most of the people use Youtube, Gmail only, majority people use Youtube and I believe no one would like buffering their video so pretty smart people but If you follow this trick you can outrun them haha! I'll be writing another article on Torrent tomorrow, don't forget to subscribe and share this article! P.S. my speedtest.net snap haha! Hey guys Happy New Year! it's been ages since I wrote any article on BloggerHero.com, I was completely occupied with few projects for last few months and I guess I'll write some articles on my experience (Visual Effects and Digital Marketing). So in today's article we'll see how you can download books from Google Books easily for FREE with the best trick without getting your IP banned. As all we know Google Books has almost millions of Book Previews where you can checkout any context from any book (I have spent my 3 sems on google books haha!) but the problem is that you just can't download anything from Google Books, all you can do is traditional method which is capturing a screenshot but that may take billions of years if your book is having more than thousands of pages so what if you can have much more easy and automatic tool? I guess it'll save a lot of time and effort as well. 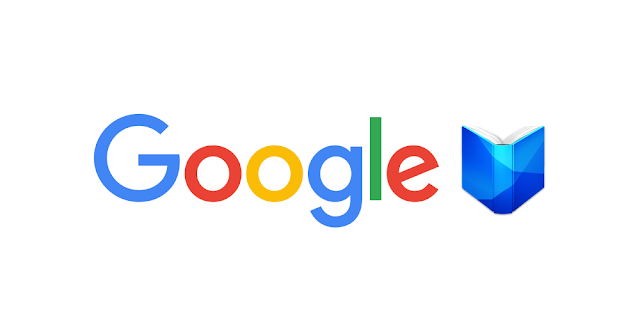 Now go to this Greasemonkey Google Books Downloader Script page and click install, the script will be automatically installed with greasemonkey addon, that's it! you are done. Now bookmark the page and whenever you get error download complete (It won't download all pages at first time) now if you get error, save your files and open the zip file and check what was the last page number and now restart your browser, open that bookmark and enter that number instead of zero at I already have __ and click start, so repeat this process until you get all of the preview pages. Now for adding all images to pdf, you can go to convert-jpg-to-pdf.net and upload your all images and convert them into pdf for easy reading. I hope you guys must have liked this tutorial and I'll be writing lots of stuff now as I get time so stay tuned subscribe, like follow and share and have fun! Disclaimer : This tutorial is only for educational purpose, for any copyright material you this trick at your own risk.